The list of acclaimed guitarists is long and illustrious. The vast majority of them started with stock instruments. Many of them have modified them to create their signature sound, either by themselves or with the help of guitar pros. A handful of guitar legends have become so identified with their sound that their guitars have become almost as famous as the players themselves. Let’s have a look at some of these signature guitars. He was one of the pioneers of rock and roll, with his famous “shave and a haircut, six bits” rhythm guitar style that launched a thousand imitators. He was almost as famous for his guitar, with its cigar-box-shaped body. He designed it (along with Gretsch Guitars) to allow him to jump around on stage while playing. Although John Lennon used many guitars while in the Beatles and during his solo career, this guitar is the one most identified with John. It has become almost as iconic as Paul McCartney’s Hofner violin-shaped bass. Although he used it mostly as-is during the early recordings, by the time it made its appearance on the REVOLUTION promo video and the LET IT BE film, John had modified it slightly to give it a harder, edgier tone. Many guitarists (and rock music lovers in general) have shaken their heads in awe of the Queen guitarist’s signature guitar sound. He had more of a personal hand in creating his own tone than most. He built his own guitar in 1963 (with his father’s help) with wood from an 18th-Century fireplace mantel. With only minor changes made, it has been his go-to guitar ever since. The King of the Blues has been using the Gibson ES355 since the 1940s. He saved his guitar from a burning building during a concert appearance in 1949.The fire was started by a kerosene lamp knocked over by two men fighting over a woman named Lucille. The rest, as they say, was history. Old Slowhand reportedly received his Gibson SG from George Harrison. It was painted by a Dutch design team and rock band called The Fool. That was the name Clapton used for the guitar which was his primary axe during his days with Cream. 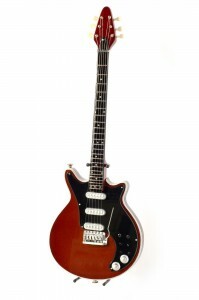 This guitar was later owned by Todd Rundgren, who ironically had seen Cream perform live at their US debut in New York. In his solo work, Clapton is better known for playing his black Stratocaster, affectionately known as Blackie. These are but a handful of the most iconic guitars in history. In the end, however, it is just as much about technique, drive, and talent.